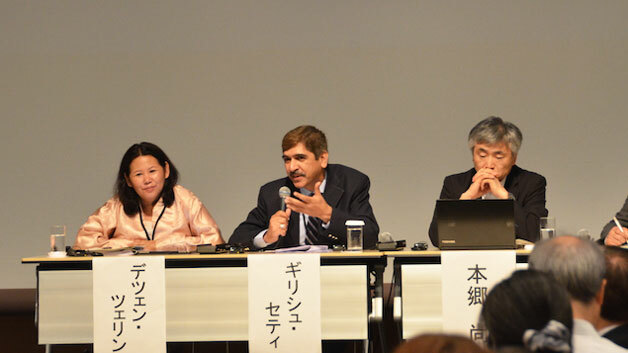 On 25 July 2017, UNU-IAS co-organized with the Institute for Global Environmental Strategies (IGES) a session on Innovative Approaches to Stimulate Low-carbon Technology Transfer at the Ninth International Forum for Sustainable Asia and the Pacific (ISAP 2017), on the first day of the two-day conference held at Pacifico Yokohama. To begin, Naoya Tsukamoto, UNU-IAS Project Director, delivered opening remarks, stressing the role low-carbon technology could play in decoupling economic development and resource consumption and the importance of building a system to connect publicly funded technology transfer and privately funded technology transfer. He highlighted the vital role of stakeholders in this process. Norichika Kanie, Professor at the Graduate School of Policy and Media, Keio University/Senior Research Fellow, UNU-IAS, served as the moderator of the panel discussion that followed and posed questions on two main topics: “How to cope with different phases of low-carbon technology transfer” and “What kind of model is effective for matchmaking? “. To address the first topic, the panel focused on the importance of customization and of including competitors. On the second point, the possibility for utilizing crowdfunding as a model and the effectiveness of local workshops and on-site platforms in addition to online platforms were raised. The session concluded with an emphasis on the importance of considering human resources in the context of developing new platforms for emerging technologies.